For decades, Major League Baseball’s goofy love affair with chewing tobacco was so passionate that the gooey stuff was stocked by teams in clubhouses as surely as jocks and socks. Nearly all ball players had golf-ball-sized cheek bumps, and part of the show was spitting streams of saliva in dugouts from coast to coast. But now the end may be near. If a bill formally introduced in the state Capitol Tuesday becomes law, the use of “smokeless tobacco” will be banned in every baseball venue in the state — from San Jose sandlots to San Francisco’s AT&T Park. They would join minor league parks, which already outlaw it. The legislation was touted Tuesday at news conferences in Sacramento and San Francisco, where leaders of the Campaign for Tobacco-Free Kids took the podium. Their program, called “Knock Tobacco Out of the Park,” included commentary about oral cancer taking down beloved Hall of Famer Tony Gwynn, a retired San Diego Padre, in 2014 at age 54. And now retired Red Sox pitcher Curt Schilling is battling cancer that he openly blames on his longtime chewing habit. Opio Dupree, Thurmond’s chief of staff, said Tuesday that the penalties for violating the proposed ban have not yet been determined. As news about the bill flew like foul balls on Tuesday, baseball players at spring training in Arizona Tuesday had a range of reactions. “My mom and my future wife, they’re hassling me all the time to quit,” added Susac, 24, who tries not to chew on the field or in public. In a statement Tuesday, Major League Baseball said it is in favor of getting rid of smokeless tobacco. “We have sought a ban of its use on-field in discussions with the Major League Baseball Players Association,” the statement said. In the ‘90s, baseball announcer Joe Garagiola led the movement against chewing tobacco by teaming with retired major leaguer Bill Tuttle, who had mouth cancer. The pair traveled to ball parks to show the deformities — the loss of his teeth and gums, his jaw and his right cheekbone — Tuttle suffered from 40 years of chewing. He died in 1998. While the players association had no response on Tuesday, Matthew Myers, president of the Campaign for Tobacco-Free kids, said the bill is the start of a national movement by nine national organizations. Thurmond, 46, elected last fall in a special election, said he has devoted his life to protecting youth. “My mom died from cancer when I was 6 years old,” he said. Meanwhile at spring training, Giants pitcher Tim Hudson, a non-chewer, predicted a number of players will not go down easily and will test the limits of the regulations. The New Year always brings a sense of hope and conviction to improve our lives. New Year’s resolutions abound. With the New Year come new beginnings, fresh starts, and promises for a brighter future. We try to move on from the losses and trials of 2014, but we never forget. The people we’ve lost will be in our hearts forever, and the trials can be viewed as life lessons and opportunities. As World Oral Health Day (WOHD) 2015 approaches, FDI World Dental Federation wants people to make a healthy New Year’s resolution and reduce their use of tobacco – or give it up completely – as part of the 2015 World Oral Health Day Smile for Life campaign. (1) Tobacco use can significantly increase the risk of many serious oral health problems, including oral cancer, periodontal disease, early tooth loss, tooth discoloration, oral malodor, and a reduced ability to taste and smell. Dental and dental hygiene office visits can create an opportunities to help patients quit smoking and using tobacco, yet dental settings are often not used for treatment of tobacco dependence. The purpose of one study was to evaluate issues that may influence patterns of tobacco-use-related practice among a national sample of dental providers. (2) Researchers surveyed a representative sample of general dentists practicing in the U.S. More than 90% of dental providers reported that they regularly ask patients about tobacco use, 76% counsel patients, and 45% routinely offer cessation assistance. This was defined as referring patients for cessation counseling, providing a cessation prescription, or both. Results showed that cessation assistance was associated with having a practice with one or more dental hygienists, having a chart system that includes a tobacco use question, having received training on treating tobacco dependence, and having positive attitudes toward treating tobacco use. Providers who did not offer assistance but reported they would change their practice patterns if they were sufficiently reimbursed were likely to be in a group practice, treat patients insured through Medicaid, and have positive attitudes toward treating tobacco dependence. The results indicated the benefit of increasing training opportunities and promoting changes to increase the involvement of dental providers in conducting tobacco use treatment. Reimbursement models should be tested to assess the effect on dental provider practice patterns. The ADA issued a letter on “modified risk” tobacco products. (3) In a letter signed by the president and executive director, the ADA expressed to the FDA that “it is ‘virtually impossible’ to justify claims that smokeless tobacco and such newer generation products as electronic cigarettes and hookah tobacco ‘are somehow less harmful to the oral cavity than combustible tobacco products or without other adverse effects.’” The ADA strongly supports developing the published research on the latest generation of tobacco products and the short- and long-term effects of these products on oral health. Last, but not last, there is a new report on smokeless tobacco. (4) Smokeless tobacco (ST) products present a multifaceted and extensive challenge to public health that has not been adequately addressed by researchers and policymakers. International tobacco control efforts have largely focused on cigarettes, and dedicated only limited attention to other types of products, including smokeless tobacco. This report addresses these issues. 2. Jannat-Khah DP, McNeely J, Pereyra MR, et al. Dentists’ Self-Perceived Role in Offering Tobacco Cessation Services: Results From a Nationally Representative Survey, United States, 2010–2011. Prev Chronic Dis 2014; 11:140186. http://www.cdc.gov/pcd/issues/2014/14_0186.htm. 3. ADA News. December 5, 2014. http://www.ada.org/en/publications/ada-news/2014-archive/december/ada-comments-on-modified-risk-tobacco-products. 4. National Cancer Institute and Centers for Disease Control and Prevention. Smokeless Tobacco and Public Health: A Global Perspective. Bethesda, MD: U.S. Department of Health and Human Services, Centers for Disease Control and Prevention and National Institutes of Health, National Cancer Institute. NIH Publication No. 14-7983; 2014.http://tobaksfakta.se/wp-content/uploads/2014/12/SmokelessTobaccoAndPublicHealth_AGlobalPerspective.pdf. The Oral Cancer Foundation (OCF) is partnering with Cody Kiser, a rodeo cowboy who will serve as a spokesman for the group, at the Snake River Stampede Rodeo, held July 15-19 in Nampa, ID. Kiser hopes to serve as a positive role model for children and teens that look up to cowboys as their heroes in the rodeo world. 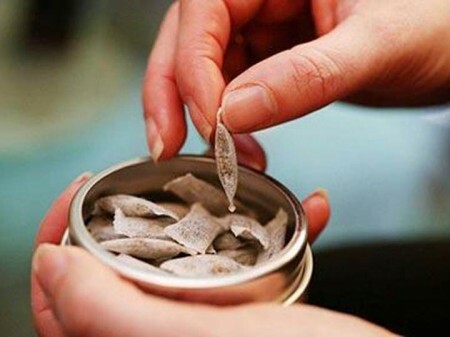 Research shows that as many as 15% of high school boys use smokeless tobacco in the U.S. With the nicotine content in a can of dip equaling approximately that of 80 cigarettes, this addiction can be one of the hardest to break, which is why the OCF hopes to educate parents and youth about the dangers before they get started. OAKLAND – Tony Gwynn’s multitude of accomplishments, career batting average of .338 and his pioneering use of video earned him the rapt attention of players whenever he talked baseball. Major League Baseball hopes an even more important message he’s delivering posthumously sinks in as well. Gwynn, who died of mouth cancer Monday at 54, speaks out against smokeless tobacco use in a taped segment of an informational video MLB is producing and plans to release this season. The Hall of Fame outfielder believed he developed cancer because of his years-long habit of using spit tobacco, although that was never medically confirmed. Whether Gwynn’s untimely death and his stance against smokeless tobacco will curtail its use among players remains an open question. Research by the Pro Baseball Athletic Trainers Society revealed the number of major leaguers who use spit tobacco has declined from about 50% to 33% in the last 20 years. However, that’s still about 10 times the amount in the general population, according to the American Cancer Society, whose data from 2012 showed 3.5% of Americans 12 and older – or 9 million – use the highly addictive product. Indeed, the stance among players seems to be that they’re aware of the dangers but, like smoking, it’s up to every individual to decide whether to use what remains a legal product. The National Cancer Institute says in its website that smokeless tobacco contains at least 28 chemicals that have been found to cause cancer – typically of the mouth, esophagus and pancreas – and may also lead to heart disease, gum disease and oral lesions. And while Gwynn’s passing was lamented throughout the game, it doesn’t figure to be interpreted by many players – who are usually in their 20s or early 30s, with the concomitant sense of invincibility – as a cautionary tale. Baseball has taken steps to sway that decision, or at least make the practice less visible to minimize the impact on young fans. The current collective bargaining agreement, in effect from 2012-16, bans players, managers and coaches from using smokeless tobacco during TV interviews and team appearances. And they have to keep tobacco products out of sight while fans are at the ballpark. In addition, MLB and the players union have stepped up educational efforts, and teams – which in the past freely distributed cans of dip in the clubhouse – can no longer do so and are now required to administer oral exams as part of the spring training physicals every year. Longtime TV announcer Joe Garagiola, who quit his smokeless tobacco habit in his 30s, made it his life’s mission to warn other baseball folks about its dangers, making presentations during spring training alongside former major league outfielder Billy Tuttle, who died of oral cancer at 69 in 1998. “I don’t think we talk about it enough anymore,” says Atlanta Braves manager Fredi Gonzalez. “I remember as a young A-ball manager, Joe Garagiola would always come around in spring training with Bill Tuttle. It was scary. “And I still see people chewing tobacco. Not only in the big leagues, but you still see kids in junior high and high school. Indeed, the sight of players constantly spitting, some sporting a large wad of tobacco inside their cheek, remains one of the game’s enduring images. Players say using smokeless tobacco provides a form of relaxation and becomes part of their routine in a daily sport with lots of down time. And with amphetamines now banned from baseball, the jolt of energy from the nicotine in the tobacco – absorbed during a longer stretch through dip or chew than by smoking – can help players navigate the season’s six-month grind. Commissioner Bud Selig has expressed a desire to banish smokeless tobacco from the majors the same way MLB barred it from the minors starting in 1993. But the issue is subject to collective bargaining and the players association has declined, opting to protect personal freedoms and emphasize education. Tony Gwynn could handle a bat like few other major leaguers, whether it was driving the ball through the “5.5 hole” between third base and shortstop or hitting a home run off the facade in Yankee Stadium in the World Series. In a rarity in pro sports, Gwynn played his whole career with the Padres, choosing to stay in the city where he was a two-sport star in college, rather than leaving for bigger paychecks elsewhere. His terrific hand-eye coordination made him one of the game’s greatest pure hitters. He had 3,141 hits — 18th on the all-time list — a career .338 average and won eight batting titles to tie Honus Wagner’s NL record. Gwynn’s son, Tony Jr., was with the Philadelphia Phillies, who later placed him on the bereavement list. He was drafted by both the Padres (third round) and San Diego Clippers (10th round) on the same day in 1981.